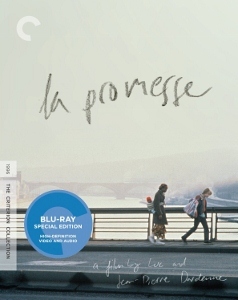 Article first published as Blu-ray Review: La Promesse – The Criterion Collection on Blogcritics. La Promesse is the story of a teenage boy who learns that his father is not a very ideal role model. 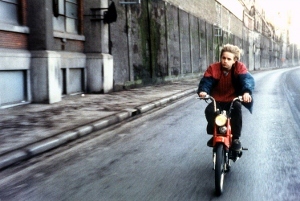 Released in 1996, this French film was written and directed by brothers Jean-Pierre and Luc Dardenne. The Criterion Collection has released the film on Blu-ray and it’s not hard to see why they chose to showcase it. From the naturalistic performances to the grimy atmosphere, La Promesse feels authentic and is deeply thoughtful. Roger (Olivier Gourmet) is a slumlord who exploits illegal immigrants who he sneaks into his working class French neighborhood. He hasn’t a shred of sympathy for these people. He takes their money, renting them rooms in a building fouled by the stench of a broken sewage pipe. He employs them to work construction jobs for his benefit, underpaying them as much as he can get away with. His young teenage son Igor (Jérémie Renier) is his protégé. When we first meet Igor, he is ripping off an old lady who just collected her pension. Roger and Igor have a very curiously detached relationship. Roger insists his son address him by his first name, rather than “dad” or any similar variation. Igor obeys his strict disciplinarian father, while also following close in his footsteps. These immigrants aren’t really people to them, but instead just a means to earn money in the most unscrupulous of ways. After carefully establishing a generally depressing milieu, the Dardenne brothers introduce the main thrust of the story. One of Roger’s workers, Amidou (Rasmane Ouedraogo), seriously injures himself at the work site during an unexpected raid by immigration authorities. 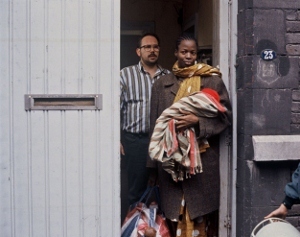 Igor instinctively tries to help Amidou, who is in dire need of medical attention, but his father decides they will leave the man for dead and dispose of the body. Unbeknownst to Roger, Amidou’s dying request of Igor is that the boy sees to it that the wife and child he is leaving behind are taken care of. Igor’s affirmative response is the “promise” of the film’s title, and the beginning of a major change in his outlook. To explain any further about the actions of these characters would be an injustice to the film. Not to suggest this is a suspense film with twists and turns, but honestly this is a very modest story. Its richness comes from details that are difficult to convey in a plot summary. La Promesse is the journey of young person struggling to let his conscious be his guide, despite the overpowering influence of a supremely self-serving parent. La Promesse was shot on Super 16mm and blown-up to 35mm for theatrical presentation. According to Criterion’s notes in the booklet, it was from a 35mm blow-up that this 1080p transfer was made. Framed at 1.66:1, the visual presentation is solid in all respects. The heavy grain that is apparent almost all the time (particularly during dimly lighted scenes) is to be expected due to the original small-gauge film format. Detail is also lacking during wider shots, again stemming from the original format. The colors are a bit washed out, with black levels never going beyond dark gray. But Criterion appears to have done everything right here in presenting the film as the Dardenne brothers intended. The 5.1 DTS-HD audio presentation is a pleasant surprise, though its strength is in its subtlety (much like the film itself). The French dialogue is mixed appropriately and undistorted. Everything about the sound design was aimed at creating a natural experience. As such, the surrounds are utilized only occasionally. Still, they are used very effectively for car horns, dog barks, and other commonplace sounds that achieve that desired effect. Make no mistake, this is not a very eventful surround mix, but it does a very good job of providing some minor immersive effects that maintain a documentary feel. Criterion has included a pair of substantial supplemental features. The first is an hour long interview with Jean-Pierre and Luc Dardenne, recorded exclusively for Criterion earlier in 2012. They discuss all aspects of La Promesse at length in this enlightening look at their creative process. The other piece is an 18 minute interview, also recorded this year, featuring actors Olivier Gourmet and Jérémie Renier. Interviewed separately, the two men reflect on the experience of making the film. Speaking of Renier and Gourmet, they were almost completely without acting experience when the film was made. Their utterly realistic, understated portrayals are essential to the success of La Promesse. The film’s conclusion is somewhat frustratingly ambiguous, but that should not discourage anyone from embarking on the well-crafted journey to reach that end.